I was sitting on a bank on the shore yesterday and spoke to a lady that was sitting next to me. The subject was about fresh veggies, fresh squeezed fruit juice instead pasteurized and also talked about medicine fruit, grapefruit. She said that she has a glass of grapefruit every morning. After a while, I learned more about her. She was using an antidepressant. Adding a glass of grapefruit to your breakfast, might be dangerous sometimes, depends on the medicine you take or dossage taken, I said. She said, that is just a fruit and vitamin-C. What could possibly be dangerous about grapefruit. At least she accepted to ask her doctor about it. Eating grapefruit and drinking it's juice is a big helper to reduce body fat, might have a lower risk of getting cancer as so many researches indicate. A cup of Vitamin C-rich food like grapefruit provides all day's worth of Vitamin C. Those are all true! So, what could possibly be dangerous about a fruit? As soon as I got back home, refreshed my knowledge, searched and remembered the post Pick me!! !..Love me!!! I made in 2010. I needed to share it with you guys with this little but very important detail today. National Grapefruit Month is February, but I missed it. Over four years, researches show that, grapefruit does interact with some medications for anti-cancer, anti-infective, anti-cholesterol, cardiovascular, central nervous system, gastrointestinal, immuno suppressants and urinary tract. 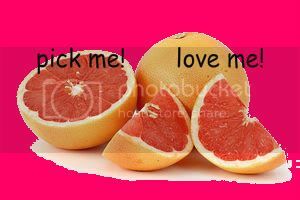 Grapefruit is the biggest treat, bitter oranges (Seville oranges) and lime might have a similar effect with some medicines, from what doctors say. Bottom line, if you like to eat this fruit or drink grapefruit juice, better talk to your doctor before starting a new medication. If there is no reason not to eat this wonderful fruit, this post below will give you more ideas to enjoy it! * It can be juiced fresh(yummy for breakfast) Very helpful to weight loss!